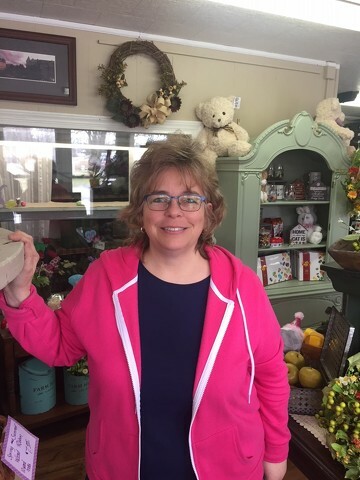 Susan Munnell is the new owner of A Flower Basket in Bellefonte. BELLEFONTE — Bellefonte business A Flower Basket is celebrating the change of ownership with a grand opening from 9 a.m. to 5 p.m. and a ribbon-cutting event at 11 a.m. Saturday, April 14. The Flower Basket is located at 633 E. Howard St.
Susan and Craig Munnell, who bought the business in September 2017, hope to continue the business’ reputation for quality products and personalized service that Faith Weaver Miller carried out for 23 years. Many local businesses and churches rely on The Flower Basket for their needs. The new owners still have FTD, Teleflora and Bloom Net available as wire services. During her 29 years as an elementary school teacher in Mifflin County, Susan Munnell dreamed of starting a business. Now, she can hardly believe that she lives a few houses away from her work place, after years of an hour commute each way to her job. Craig Munnell is busy with his own business, Professional Landscape Maintenance. He also is a pastor at Tusseyville United Church of Christ. The Munnells have redecorated and added a gift shop to the front of the store. “I hope that people will see the gift shop as a place to find unique items to combine with flowers for a special gift. A customer can find a stuffed animal to add to a gift for a new mother or buy a vase that says, ‘Thanks for watching my dog,’” said Susan Munnell. The Munnells hope to have the greenhouse updated and in use by next spring. The merchandise in the shop ranges from baby gifts to items for seniors. If buying for a man is challenging, Munnell said she can help. Among the new products at the store are Jack Daniel’s candy and Scottish foods and teas. Munnell extended a thank you to former owner Miller and to the Small Business Development Center of Penn State for its help in establishing her lifelong dream. She said it would not have been possible without them. “The whole community has been so supportive. I want to recognize them and show appreciation by holding the grand opening,” she said. The ribbon-cutting event will provide an opportunity to check out the shop and to meet the shop’s mascot, Lucy the cat. Those who attend the grand opening can meet vendors, sample products, watch demonstrations and more.